Please note: You can set up a native 2-way sync between airfocus and Jira with just a few clicks. This article is for experts only that have specific mapping needs. Sync airfocus with 1,000+ apps through the Zapier platform to automate your work and find productivity super powers. Go to https://docs.google.com/spreadsheets, start a new spreadsheet and name it airfocus-jira-mapping. (You don't have to use the exact same names like in this example, but it will help). Copy the headers airfocusId and jiraKey into the first row of your Google sheet. You need a total of 4 Zaps for a fully working 2-way synchronization. Go to https://zapier.com/app/dashboard and hit “Make a Zap!” to create your first Zap. Select the Jira app and choose "New issue" as your trigger. 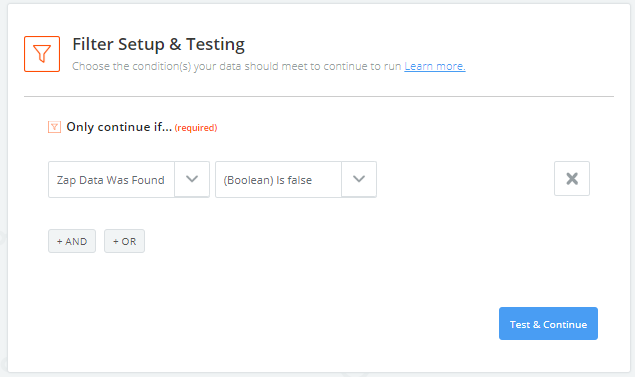 Then connect your Jira account, select your Jira project and test the connection. Create another Zapier step and select the Google Sheets app (choose “Lookup Spreadsheet Row”). Connect your Google account and when asked, choose the recently created spreadsheet airfocus-jira-mapping and its worksheet ("Sheet 1" by default). Remember, the one with the headers airfocusId and jiraKey? Choose jiraKey as Lookup column and the parameter key from the Lookup value dropdown menu. 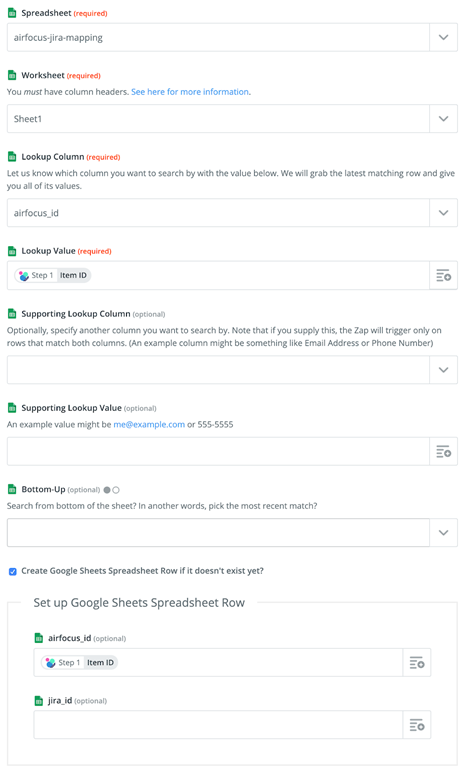 Now click the checkbox “Create Google Sheets Spreadsheet Row if it doesn’t exist yet?" (it has to be activated). Click continue and test this step. 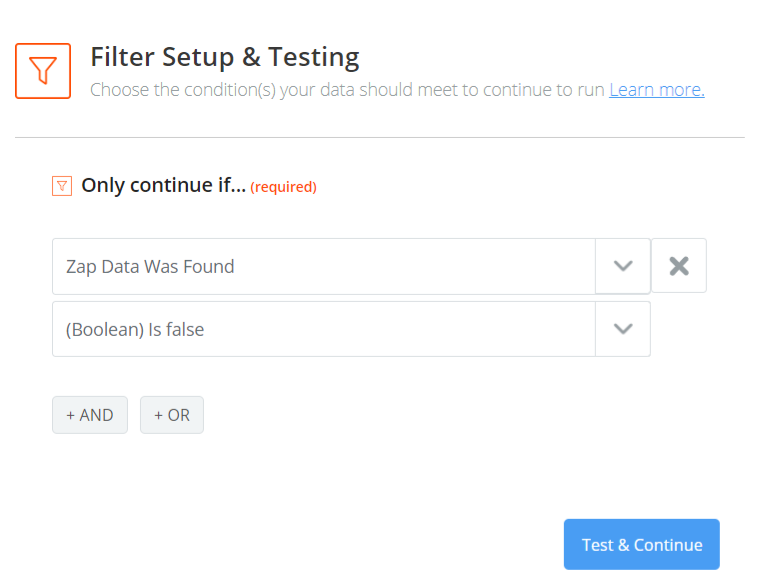 Add another step and select "Filter". 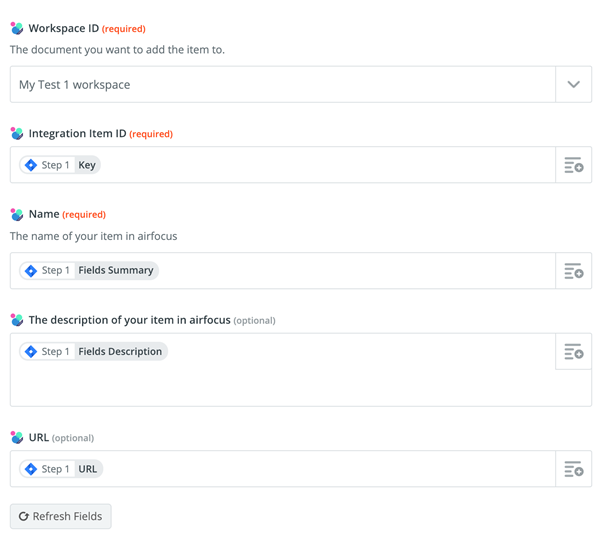 This step is required to make sure Zapier only synchronizes a new item, if it is not yet mapped to a Jira issue. Choose the option "Only continue if...". Then click "Find and create row" and "Zap data was found". After this is done, select "(Boolean) is false". Click "Add step" on the left Zapier column, create a "Action/Search" Zap and choose the airfocus app. (Version 1.1.0 or higher. If it is not available, let us know via chat). Click "Create item" and map all the Jira issue fields to the corresponding airfocus item fields like in the example below. This 5th and last step is important to map the airfocus item key to the corresponding Jira key. Create another action step in Zapier by clicking "Add step". Choose the Google Sheets app and then click "Update spreadsheet row". Now select the spreadsheet airfocus-jira-mapping and the same worksheet as before. (Sheet 1 by default). Row → "Use a custom value"
Congratulations! You created your first Zap! 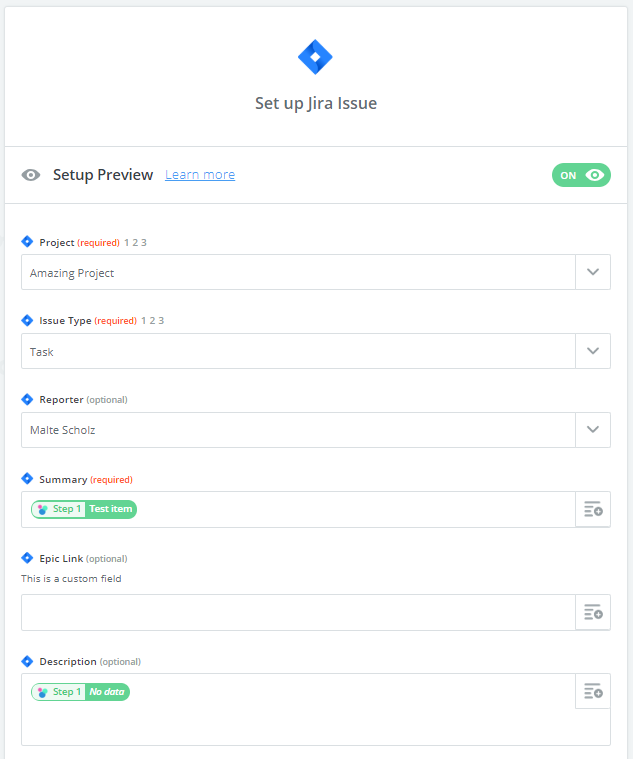 Name it New airfocus item → Create Jira Issue and activate it! This Zap is very similar to the first one. It makes sure a Jira issue is sent to airfocus upon creation. As you already know how to set up Zapier Zaps, the next Zaps will be explained in a more compact way. Don't forget to click the checkbox "Create Google Sheets Spreadsheet Row if it doesn't exist yet?" First dropdown menu: 2 Find or create row → "Zap data was found"
Issue Type: Choose a Story or Task. You can change that later. This step is required to complete the mapping of airfocus ID and Jira key from Step 2. Row: "Use a Custom Value (advanced)"
When you Zap is fetched and tested, name it New Jira issue → Create airfocus item and activate it. This time DO NOT click the "Create Google Sheets Spreadsheet Row if it doesn't exist yet?" checkbox. Name your Zap Update Jira issue → Update airfocus item and activate it. ATTENTION: This one is a bit tricky: Please choose any Jira issue. After fetching is done (it starts automatically and should take 2-10 seconds) change the value to "Use a Custom Value (advanced)". Name your Update airfocus item → update Jira issue and activate it.